Photo (approx. 4 x 5.5 inches) mounted on cardboard backing/frame (5.25 x 7.25 inches). Photographer is Lundelins of Port Jervis, New York. Otherwise undated and unidentified. I like this photo. These two appear to be decked out a little more elegantly than I’m used to seeing for a portrait like this. Not that I’m complaining, since they both look very nice. She looks quite pleased, and he has a bit of a twinkle in his eye, which makes me think either they are amused to be playing dress-up or they are comfortably accustomed to dressing so well. I think the pose is interesting, too, with the woman standing almost forward, and yet without the appearance of an imbalance. Gotta love the painted drop. 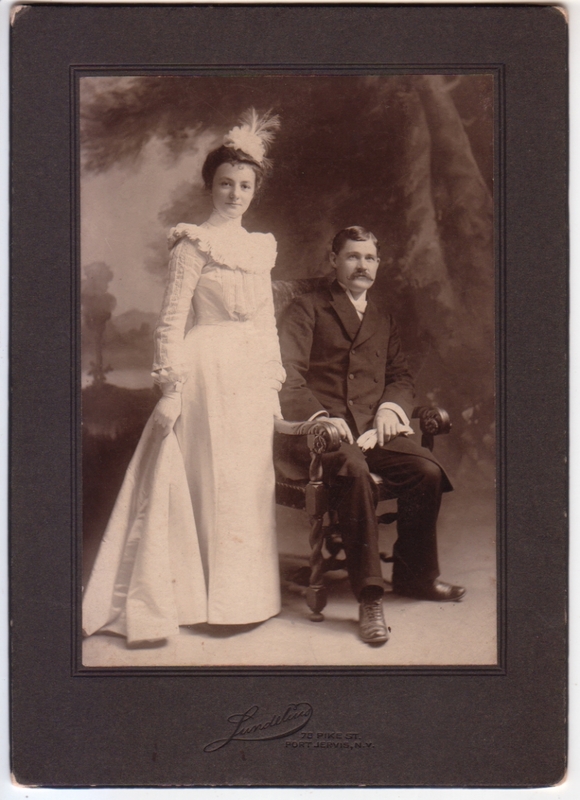 My guess is that it’s their wedding photo, probably taken right around 1900.